ReBoot: The Guardian Code is happening people. Corus Entertainment is helping Rainmaker Entertainment bring the new series to life and it’s still set to star four teens who are streamed into cyberspace to battle viruses. It’s not exactly what older fans of the series wanted to hear; however, it will definitely appeal to today’s audiences. ReBoot was a 3D-animated television series that first aired on YTV in 1994. It starred Dot and Enzo Matrix, two sprites living in the computer system of Mainframe. There they meet Bob, a Guardian, who is helping to protect the system from the ravages of viruses, tears, and bugs with the aid of his powerful Keytool Glitch. The series started out fun and happy go lucky, but got more serious with each season taking characters to new places and putting them up against new bad guys. But in 2002, the series ended on a cliffhanger with Mainframe’s fate hanging in the balance. Over the years there have been a few attempts to bring the show back to North American audiences, but the show seemed to always slip through the cracks… until now. However, this is a much different world than it was in 2002. Since then, youth television programming has become more teen soap-opera oriented. Shows like iCarly, Big Time Rush, Sam & Cat, etc. have helped revive the Saved By The Bell kind of show that went through a bit of a lull during the early 2000s. And it makes a little sense that Rainmaker would include a live-action angle in the new show in order to make ReBoot sell with North American audiences. However, the idea behind The Guardian Code isn’t exactly original. Back in 1994, Tsubaraya and DIC Entertainment first broadcasted Superhuman Samurai Syber-Squad in North America. Starring Sam Collins and his friends, S4’s characters streamed into cyberspace to battle viruses and protect the cyber world… starting to sound a little familiar? The immediate difference between The Guardian Code and Superhuman Samurai Syber-Squad is that ReBoot is based on a preexisting series and will be taking a lot from the original show. Characters like Bob, Dot, and Enzo will be making appearances, which opens the door to concepts from the original show like the differences between the Web and the Net, and so on. S4 was based off of Japan-produced Denkou Choujin Gridman. 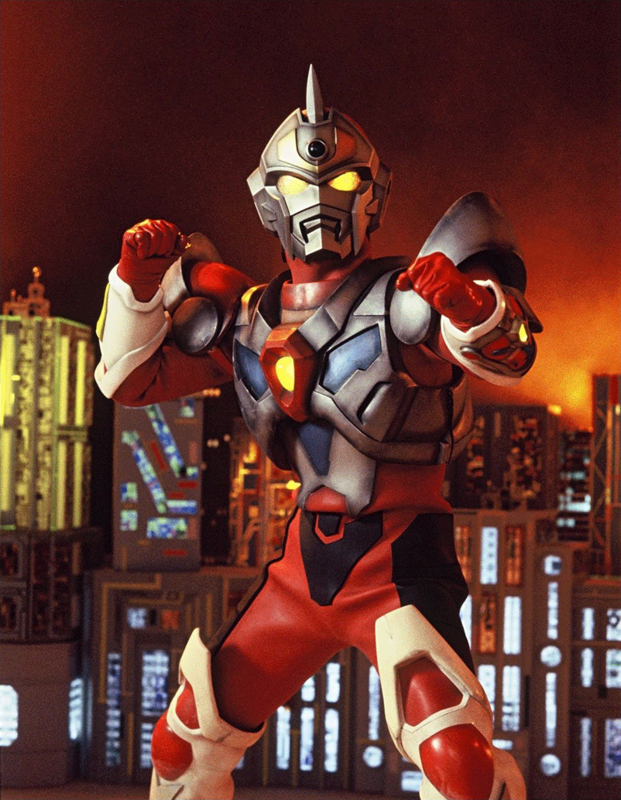 In that show, three Japanese kids develop the Ultraman-esque hero as a video game character only to discover he’s possessed by a digital police officer named Gridman. A troubled schoolmate uploads a virus to disrupt the local infrastructure at the behest of the Dark Lord Kahn Digifer (which is a way cooler name that Kilokhan from the North American version). The same exact thing happens in the North American version except there was only one season and it ended with a whimper, not a bang like the Tsubaraya show. For some reason, S4 didn’t have the same resonance with younger people as the Power Rangers even though it had a unique concept. The culprit: no one knew what the Internet was back in 1994. S4’s understanding of computers was laughable, they had little to no reverence for the show’s Ultraman heritage, and the characters weren’t memorable (except for Glen Beaudin’s character Malcolm). One advantage The Guardian Code has now is that kids these days have been on the Internet since the day they could hold a smartphone. Young students are also starting to take more computer science courses because they know computer skills are an important asset for their future. Never could there be a better time to have a show that uses the knowledge that kids have of the Internet, video games, and computers in order to create a world of infinite, creative possibilities. Unfortunately, the kids in The Guardian Code are going into a world where there are tonnes of issues with humans taking part. Hours in the ReBoot world are measured in seconds, minutes in milliseconds, and seconds in nanoseconds (Internet correct me if I’m wrong here), so how are the kids in the show supposed to progress in real life while they’ve pretty much halted time in the outside world? There’s also the matter of The User, or humans, being seen as God in the show. In the show’s opening, Bob says that it’s his quest to discover the true nature of the User as if he’s on some religious quest (also wrote a big piece on this a little while back). So what is Bob supposed to say when he discovers that the next-generation Guardians are just kids from the real world streaming into cyberspace? What does that mean for the older generations of Guardians, who are they? Are they just programs or are they controlled by humans as well? Are we talking about some kind of TRON-like system where people and programs can go between worlds? The show’s creators will also have to deal with the cliffhanger that the last episode left us dangling off of. Was Gigabyte dealt with? Is it the next-generation Guardians’ job to destroy him? How do Bob, Dot, and Enzo fit into a world where the world-wide web and video games have developed far beyond the vision of the original show? Well, one interesting thing to share is that ReBoot, according to some promos in the 1990s, was originally supposed to have a world similar to The Guardian Code’s, so maybe some of those original ideas will fit into the new show. Yet there are still so many questions and so few answers. What a motley crew of pixels. Rainmaker’s new show is bred with strong pedigree, but it’s taking on a style of show that would be better served without any humans involved. There are plenty of examples of animated shows that are able to work with this concept and succeed in finding an audience. Code Lyoko was an animated show developed by Thomas Romain, who now works in Japan on various animated projects. It stars four kids who discover a digital world inside of an old quantum computer. They do what any kids would do in this situation and use their 13-year-old brains to transport themselves into the world of Lyoko to save it from a malevolent force. I never watched it myself… but there are still some diehard fans out there. There’s also Di-Di-D-D-D-D-D-Digimon as another example of an animated series that’s able to bring an unlikely group of teens into a digital world have their escapades continue beyond the first season. The other obvious example to look at is TRON and TRON: Legacy. The movies developed by Disney are made for a young-adult demographic and feature real-world people going into a digital world. It’s a great example of what can be done when you have a budget and a nuanced understanding of how we view virtual space in 2015. However, The Guardian Code definitely won’t have the same budget. There are just more options if you keep the show animated, but it won’t sell with North American broadcasters if there isn’t any star power that can be developed. Bringing in humans into the show is just so problematic. They’ll have to spend millions on getting good talent for the show and every new star they bring on diminishes the budget for stirring 3D animation, which should be the true draw of the show. To summarize the various disparate points in this article: The Guardian Code has a lot to live up with and the only other show that used the same live-action and animated format failed to make it past a single season. Superhuman Samurai Syber Squad took almost its entire show from a Japanese Ultraman spinoff, but it plays around with cyberspace while including the daily antics and moral dilemmas of the show’s high school students. What they ended up with is a show that’s exceptionally out of touch with real technology and that was ultimately its downfall. The real hero of the show should have been Malcolm Frink who understood computers, yet they portrayed him as a loner and a nerd. Today, Malcolm would be an extremely valued member of any organization with his advanced understanding of computers, but he’d have to curb that sociopathic streak. The kids in The Guardian Code need to be smart and in a way that makes their interaction with a digital world feasible and filled with reverence for modern technology. I call shenanigans on ReBoot: The Guardian Code if it’s just some stupid experiment that sends the main actor or actress into the show, and then they’re just able to go back and forth like it’s nothing. There needs to be a reason why The User suddenly appears in Mainframe. This is a great opportunity to not only make computers and programming cool, but to encourage new generations to tinker, to code, and to program their way to success. There is a lot riding on this reboot of ReBoot and it’ll be a perilous few years as we wait for Rainmaker to make good on their 2002 promise for a new season. This entry was posted in Television and tagged Bob, Corus Entertainment, Dot, Enzo, Megabyte, Rainmaker Entertainment, ReBoot. Bookmark the permalink.